Perhaps the greatest fear for the parents of a newborn baby is that it might be born in any way incomplete. As humans, we have a deep and abiding need for being acceptable to each other and for portraying to others what we consider to be our normality — except, of course on those occasions when we feel we have excelled. Understandably we have the same aspirations for our children: for them to be born with “ten fingers and ten toes,” to appear and function as other children, to look like us and to be able to compete on an equal footing with others in the great adventure of life. That is why the birth of a child with a cleft lip and/or palate can be so devastating. The parents of a baby with a cleft lip and palate (roof of the mouth) will see a child with an incompletely formed face, in which there is a visible separation or opening in the top lip and palate; a child who does not look as other children, and in whom they have difficulty recognizing themselves. Oral and facial clefts occur in the first trimester of pregnancy when portions of the developing baby’s face fail to complete the normal process of growing towards each other and then joining. This causes incomplete formation of the upper lip, soft and hard palate, nose and, more rarely, the cheek and eye region — literally leaving clefts or gaps. They are the most common of the developmental deformities to afflict humankind. In the United States, about 1 in 700 babies are born with cleft lips and/or palates. An incomplete, unilateral cleft lip. 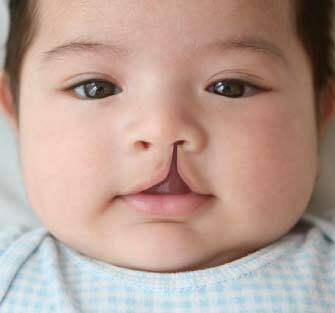 A complete, unilateral cleft lip. A complete, bilateral cleft lip. Clefts may be “unilateral” if they affect one side of the face or “bilateral” if they affect both. Clefts can be “incomplete,” meaning there is some tissue fusion in the area, or “complete” when there is none. Very rarely, instead of the cleft affecting tissues to the left or right of the facial midline (center), a median cleft can occur that affects only the midline. In any case of clefting, the resulting appearance is one of distortion and disarray, while the function of the affected tissues is severely compromised. Feeding and even sometimes breathing can be affected. If the condition remains untreated, the development of speech can be severely impaired. The cause of cleft lip and palate is by no means completely understood, though research has yielded some clues. We have evidence to suggest that some clefts are genetically induced while others have causes related to exposure of the pregnant woman and/or her fetus to certain toxic substances, dietary deficiencies, or infections while the fetal face is developing. For example, a deficiency of B vitamins (such as folic acid), an excess of vitamin A, and exposure of the fetus to alcohol, radiation or noxious chemicals can increase the possibility of facial clefts. However, in the case of the average cleft patient it is believed that clefting is likely due to a number of factors both from the environment and with the influence of genetics. But even with our limited understanding of the causes of clefts, we can practice preventive measures. We can safeguard our unborn children and their mothers from dietary deficiencies and excesses; and we can protect them from the harm of radiation, chemical warfare and infection. So what can we do about this serious condition, which has so many implications for the child and his or her family?